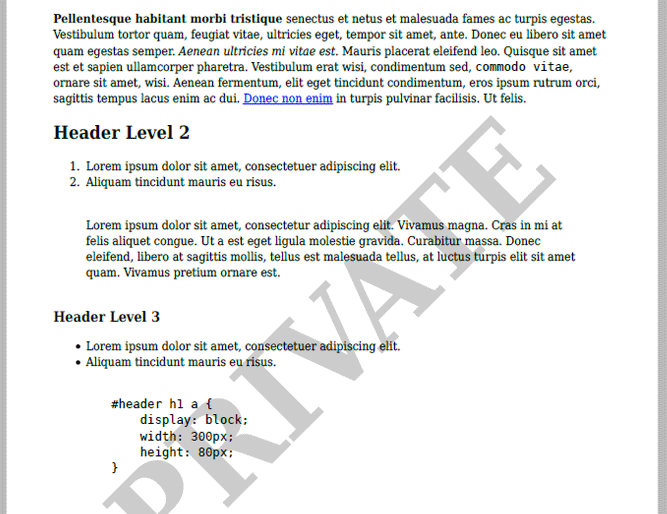 A watermark is a semi-transparent element overlaid on each page of your PDF. Both text and image watermarks are supported, and you have full control over the transparency. Watermarks cannot be used when setting the PDF format to PDF/A-1b or PDF/X-1a. The text you want watermarked on the PDF. This is a required attribute. If content is set to blank it will disable watermarking in the document from that page onwards. The content attribute must have special characters encoded correctly. This includes the <, >, ', " and & symbols. To prevent unexpected behaviour use the PHP function htmlspecialchars. Controls the text transparency and should be a number between 0-1. This field is optional. The image watermark only requires the src attribute. The alpha, size and position attributes are all optional. The URL or path to the image. We recommend using the path as it has better support across a range of hosting environments. We’ve put together a sample showing off the text and image watermark capabilities in Gravity PDF.